GR: Can you let us know a little about GreenFaith? Sean: GreenFaith is an environmental organization that has been helping people of belief into action for the Earth, within communities of all faiths and not, for over twenty years. In the beginning and for maybe the first twenty years, we’ve worked with those communities, regardless of worship, to help them become better environmental stewards, whether that means getting solar panels, shrinking their carbon footprint, or starting different community garden projects. In the last two years, we’ve really responded to the call for people of faith have to join the global movement for climate action ahead of the crucial COP21 climate talks – which took place in December last year. Out of this call came the birth of our global climate campaign leg, OurVoices. From the way I see it, our work on climate change and the environment is a way for people to show their gratitude for the people we share this planet with. GR: Do you think we are capable of acting on climate change? And what do you foresee as our greatest challenges? Sean: For sure. The bullet answer to that is “absolutely.” We have the capability of acting on it. In fact, we already have. 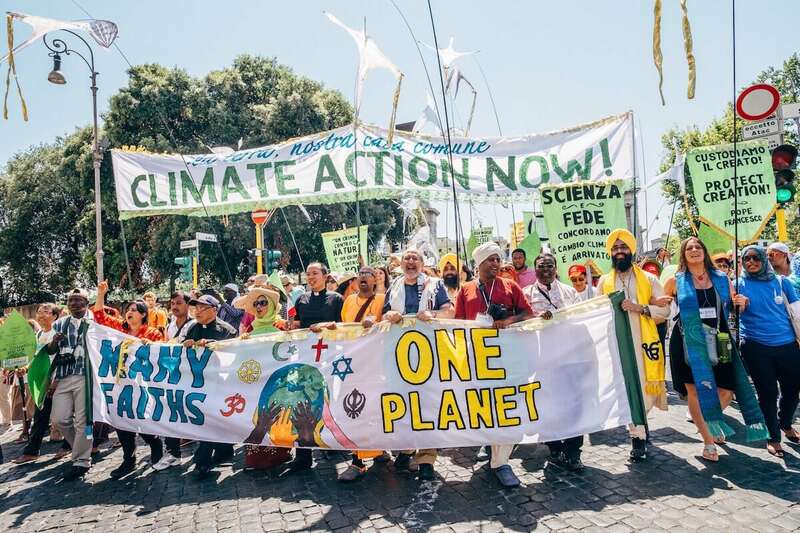 Faith communities were a huge part of the events of last year that led to 196 nations adopting the Paris Agreement in December, which is a huge win. It’s also a signal that there is still more to do. Now it’s about maintaining that pressure that we’ve been building to show political leaders that they cannot afford to ignore us. That’s the biggest challenge: making sure that our leaders don’t just take actions to protect our planet when everyone is looking. They need to be doing that at every single meeting, every single time they have a chance to vote. It’s up to us to keep that momentum so that they know we are always watching. GR: Why do you think gratitude connects people of all faiths to care about the Earth and the environment? Sean: GreenFaith believes the world is a precious gift, and as a result, that climate change is a moral challenge. We use that element to inspire people to take action. Gratitude is at the base of it all. We combine religious and spiritual communities, so we recognize that that gives us power. Then it’s just doing what we can to respect and honor [the Earth]. Last year one of the projects we worked on was The People’s Pilgrimage. It was done with the help of a lot of different organizations from around the world. It got people to take a step outside and demand climate action from our leaders, and to also take a walk in honor of those who have already suffered from climate change. 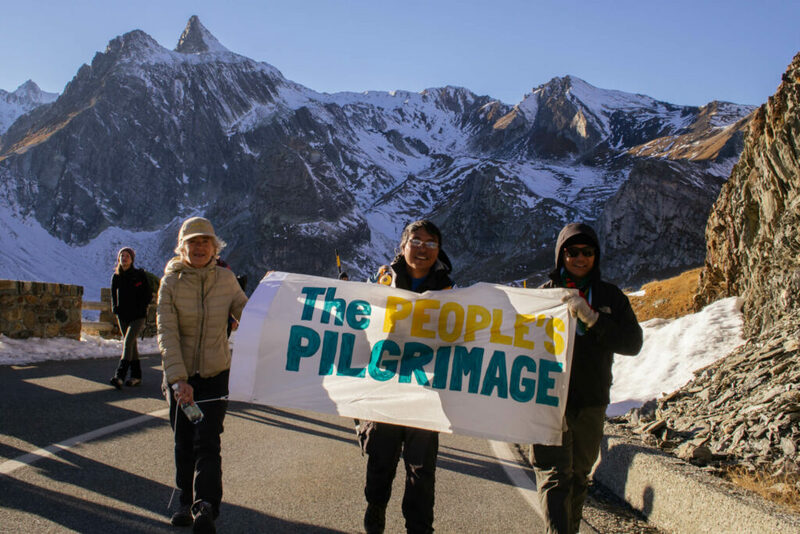 We saw this sense of gratitude truly take form in the group of twenty to thirty pilgrims who walked from Rome to Paris in two months, arriving in Paris for the start of COP21. I actually had a chance to walk with them on that final leg, and there was never more a sense of gratitude than you felt in walking with these pilgrims, because they came from all over: from the Philippines, from the United States, from Germany, from Africa, all different parts – really just willing to walk for those who couldn’t walk because they had already lost their homes, lost their livelihood, to the rising effect that we’re seeing with climate change. That’s just one of the ways where gratitude…[is] the core element of the different projects we’re doing to take action on climate change. GR: That sounds like an intense walk. Sean: Yeah, it was – and I only walked the end [of the Pilgrimage] like the rest of them. They really are some of the most inspiring individuals that I’ve been able to meet and whose stories we’re able to help share. GR: Do you have any particular stories from the people that you met? Sean: The one that grabs my attention is from Yeb Saño. He was the former top climate negotiator for the Philippines who stepped down from the diplomacy world to lead the People’s Pilgrimage. Working with him last year I was able to hear his story several times, but each time he says it, seriously and truly, it just brings something out of your heart. In 2013, while he was on the negotiating floor of COP19 in Warsaw, the Philippines were ravaged by Typhoon Haiyan, with his hometown, Tacloban, being one of the most devastated cities. He and his brother, AG, walked 857 km from Manila to Tacloban in 2014 and came together again to walk 1500km from Rome to Paris on the People’s Pilgrimage. Yeb is an unique individual because his story is at the intersection of trying to enact climate action on the political level while also being affected by climate change in an extreme way – with him essentially being able to do nothing. That’s one of the reasons why he stepped away from the negotiating tables, because he felt he couldn’t get much action done inside the negotiations. So to hear that, along with his brother, who was still in the Philippines [during Haiyan] and who lost one of his best friends (as well as their family) – is something that really touches you. I am the first to admit that this is not my story, it’s his thing, and I don’t think I could really share the same warmth and care and love that those who have actually experienced it have been able to do. And that was just one of the stories. Every city the Pilgrimage stopped in between Italy and France, they had a chance to talk with the local community. They touched so many people, and seeing the faces of those who came in contact with them there was a huge sense of gratitude that you could just see in the eyes of who they touched. GR: Something that we’re curious about is your take on how faith-based communities have come to embrace the divide between faith and science in terms of climate change. Now everyone’s coming together and saying “this is our planet, our home, no matter what you believe in, we’ve got to protect it.” How do you feel your journey has been with that, and how have you seen others come to the same sort of realization? Sean: There are still many dissident religious communities who don’t necessarily believe in climate change. I’ve been working with Green Faith now for a year and a half, and with the many different partners we have all around the world now for a year and a half, so what I’ve learned is that there are faith communities who have been and continue to always take action. In particular, I’ve learned so much about different Islamic communities committed to climate action around the world from our partners, such as Islamic Relief Worldwide, Islamic Foundation for Ecology and Environmental Services (IFEES), and Green Muslims of New Jersey. So I don’t necessarily see the divide as between those who believe and those who don’t. I see it as all these great people who believe in their own spiritual or religious beliefs, and who see climate change as a simple moral responsibility, as a moral issue to take action [upon]. There’s an inherent apprehensiveness when people hear “people of faith” and “climate change.” So that’s why we really focus on sharing the stories that we’re hearing, because the stories are the best ways for us to create change – whether changing those on the climate-denying side or those who are apprehensive of religion. We are all in this fight together. Climate change is an intersectional issue that faces us all. If we’re able to step back and listen to each other, then there’s no reason why we can’t really create the momentum we need. GR: How can we learn more about what GreenFaith is up to? Sean: The best place to find information on us is on social media. We have two Twitter handles, @OurVoices2015 and @greenfaithworld. You can also go to GreenFaith.org. On Facebook we are GreenFaith as well as Our Voices. 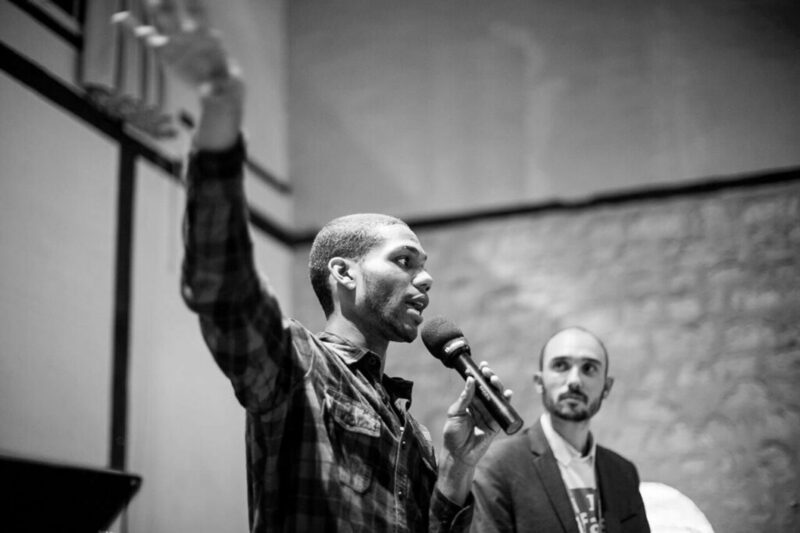 Some big things we have planned for 2016 are the 2016 Emerging Leaders Climate Convergences, as well as a day of prayer and action for people and the planet. There is a convergence happening in early June in Rio de Janeiro for Latin American and Caribbean participants, and another at the end of June in New Orleans for North America. And on June 12, 6 months out from COP21, faith communities around the world will mobilize for the Sacred Earth, Sacred Trust day of action. From India to Rio, New York to London, we’ll be getting out in the streets and celebrating our common home, and calling for climate justice for the most vulnerable people across the globe. 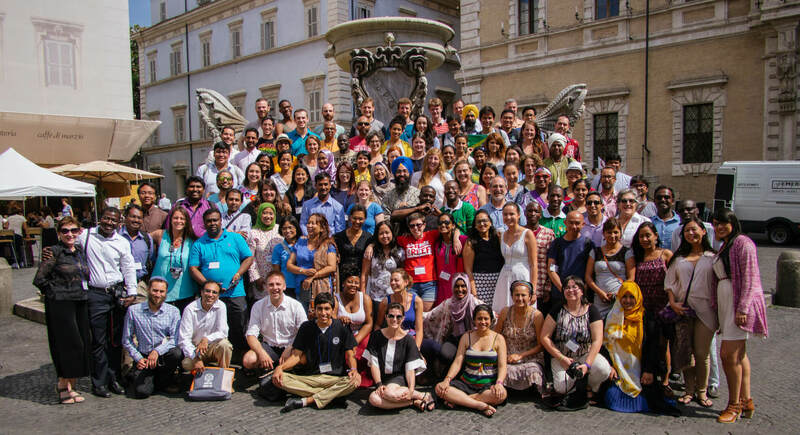 GreenFaith’s Convergence in Rome last year. Founded in 1992, GreenFaith works with houses of worship, religious schools and people of all faiths to help them become better environmental stewards. They believe in addressing environmental issues holistically, and are committed to being a one-stop shop for the resources and tools religious institutions need to engage environmental issues and become religious-environmental leaders. GreenFaith’s mission is to inspire, educate and mobilize people of diverse religious backgrounds for environmental leadership. Their work is based on beliefs shared by the world’s great religions – GreenFaith believes that protecting the earth is a religious value, and that environmental stewardship is a moral responsibility. The 2016 Emerging Leaders Climate Convergence in New Orleans is a coming together of many voices and many perspectives into a powerful and effective network. It’s a gathering of emerging leaders who want to put their beliefs into action for the environment in meaningful ways. The New Orleans’ Convergence is one in a series of Convergences which GreenFaith is holding for religious-environmental leaders from the Millennial generation. It follows last June’s Convergence in Rome, where 110 people from 30 countries gathered, and will follow a similar training in Rio de Janeiro in early June 2016, for leaders from Latin America.